Do you know or are you a fantastic community member? Nominate them or apply for a JCA award!! For all high school awards and scholarships, please send a letter detailing your achievements and have your school forward a copy of your transcript. See also the Fistal Family Nursing Scholarship. Stephen Jacobson was always active in the JCC, from his early days at Center Day Camp through receiving the Robert J. Agger Award and participating on the softball teams. He always displayed a sense of commitment and community. Stephen was not only well liked, but admired and respected. He always had a smile on his face. As many may remember, Stephen's life was tragically cut short. Stephen's commitment to both the Jewish and general community went far beyond what one would expect from one so young. 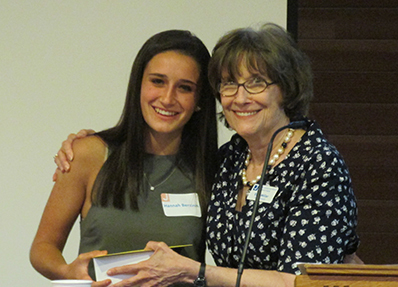 In his memory, the Jewish Community Alliance and the Jacobson Family established a scholarship fund and award to be given to a Jewish graduating high school senior who best exemplifies Stephen's ideas, compassion, leadership and desire. While this award is of great significance to the Jewish Community, the accompanying tangible award is in the nature of an honorarium. The President's Cup award is presented to the Jewish graduating high school senior from among Southern Maine high schools that has attained the highest grade point average during his or her high school career. While this award is of great significance to the Jewish Community, the accompanying tangible award is in the nature of an honorarium. As a student at Portland High School, Robert Agger was an outstanding three sport athlete in the class of 1928. He was a true sportsman and was respected by everyone with whom he played. The Robert J. Agger Memorial Award is presented to a Jewish graduating high school senior who has displayed sportsmanship, leadership and athletic ability throughout his or her high school career. While this award is of great significance to the Jewish Community, the accompanying tangible award is in the nature of an honorarium. Created by Linda and Joel’s friends in celebration of the Abromson's commitment to Jewish communal service; the Abromson Award funds projects that allow adult applicants the opportunity to explore Jewish life in a unique and creative way. Joel Abromson found energy and inspiration in his connection to Jewish life, and this award is meant to provide the same opportunities for other adults in our community. Applicants are encouraged to think ‘outside the box’ in terms of what might light their Jewish spirit – a unique travel experience, artistic project, leadership opportunity, or a completely new endeavor they are looking to create but never had the opportunity to explore. The Abromson Award challenges applicants to find an opportunity in Jewish life that excites them. To provide inspiration for future applicants, recipients are asked to present to the community at the completion of their project in a public talk, or any other appropriate public offering. Applicants are required to submit a letter of support for their project, a description of the project and how it would benefit the community, project time frame, estimated cost for the project and budget, a resume, and amount you are requesting. The committee will review all proposals and may follow up with applicants with any additional questions. The Jewish Community Alliance is proud to announce that it is accepting applications and nominations for the Aronson Young Leadership Award. The candidates for this award must be between the ages of 25 and 45. The recipient will demonstrate leadership qualities exemplified by Richard Aronson during his tenure of service to the Jewish Federation and Southern Maine’s Jewish community. These qualities include a unique dedication of one’s time, ideas, and creativity to benefit our community. This recipient will be honored at the Jewish Community Alliance’s annual meeting. In addition, the recipient and spouse will be awarded the opportunity to attend and participate in the General Assembly of the Jewish Federations of North America, the largest yearly gathering of Jewish leadership in the world. The recipient of the Aronson Young Leadership award must be a contributor to the JCA Annual Campaign. The Aronson Leadership Award is funded through the generosity of Linda and the late Joel Abromson through the Aronson Leadership Award Fund. The Jewish Community Alliance is pleased to accept nominations for the Richard D. Aronson Young Leader Award. If you would like to nominate a deserving community member, please send letter detailing the nominee’s involvement as a volunteer with the Jewish Community Alliance and the community at large. 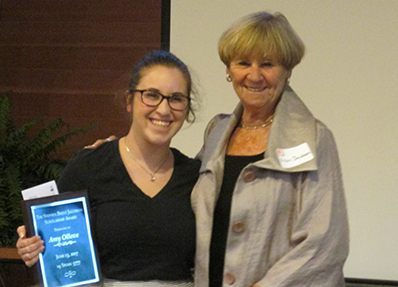 The Karen M. Lerman Volunteer Award was established in Karen Lerman's name to recognize a member of the community who has gone "above and beyond" on behalf of the Jewish Community. Karen spent 16 years as a key volunteer for the JCC, serving in numerous roles and continuing her dedication to the Jewish Community Alliance. The Jewish Community Alliance is pleased to accept nominations for the Karen M. Lerman Volunteer Award. If you would like to nominate a deserving community member, please send letter detailing the nominee’s involvement as a volunteer with the Jewish Community Alliance and the community at large. Inspired by a bequest made by a cousin, the Fistal family decided to fund a scholarship for a purpose close to their hearts. After thinking about their own educational backgrounds, they decided to concentrate on Sheri’s; an A.D. in Nursing at age 35 followed in two years by a B.S. and at age 55, an M.S.N. A scholarship will help those students who want to make nursing their career choice. 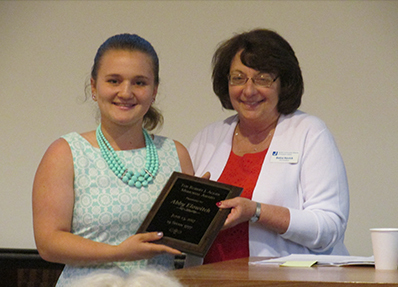 The Jewish Community Alliance, which represents the Jewish community in southern Maine, provides a ‘home base’ for the scholarship. This scholarship will be presented each year at the Jewish Community Alliance Annual Meeting to a Jewish high school senior or Jewish individual who plans to become a Registered Nurse and is accepted to a secondary school that awards an Associate’s or Bachelor’s Degree in Nursing. High school applicants must also provide a high school transcript, a description of their extracurricular activities and letters of recommendation from two teachers and one other non-related person that are familiar with the applicant’s accomplishments. Non-traditional students must submit three letters of recommendation, one from an employer or professional contact. Applications and accompanying paperwork must be submitted to the Jewish Community Alliance by May 4, 2018. The recipient will be notified prior to the scholarship being presented at the Jewish Community Alliance annual meeting in late spring. The award will be disbursed to the school where the student is matriculated. Awards will be presented in person to each honoree at the JCA’s Annual Meeting. The deadline for nominations/applications for all awards is April 29, 2019.